It is rare that the winner of a boxing championship comes to the post-match press conference in a wheelchair. So it was a strange sight watching Timothy Bradley, both feet swaddled in bandages, being wheeled into a big ballroom at the MGM Grand in Las Vegas by his father after the biggest victory of his career. 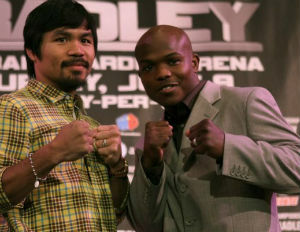 Bradley had just handed Manny Pacquiao his first defeat in nine years. It was a controversial split decision. He suffered a sprained right ankle and a strained ligament in his left foot during the bout. He made it through the fight on sheer grit. He made it out of the ring while adrenaline was still coursing through his body. When it had dissipated an hour later he could hardly stand, let alone walk. The physical pain was nothing compared to the mental anguish that Bradley endured at that press conference. Bob Arum of Top Rank, Bradley and Pacquiao’s promoter, was so disgusted with the decision that he called for the Nevada Attorney General to investigate the judges who scored the match for Bradley. Of course Pacquiao was, and remains, Arum’s pay per view cash cow. So Arum was protecting his biggest investment. That left Bradley where he has always stood in boxing — on his own.